Our adventures with horses, cats, dogs, and restoring a farm. The long-suffering, non-horsey husband got me a gift certificate to our local tack store for Christmas, with the stipulation that I could only spend the money on myself, not horse blankets (which is totally what I was planning to do). I had a bit left over after getting some new paddock boots, so I decided to splurge on a pair of these gloves. $40 is more than I would usually spend on gloves, but these are oh-so-worth-it. They are super warm and while they’re a bit thick and bulky, I’m still able to manage blanket buckles and bucket snaps while wearing them. 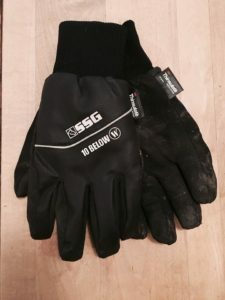 They are too bulky to ride with (for me), but as work gloves they’re great. They also seem to be very well-made, so hopefully they’ll hold up for a long time.